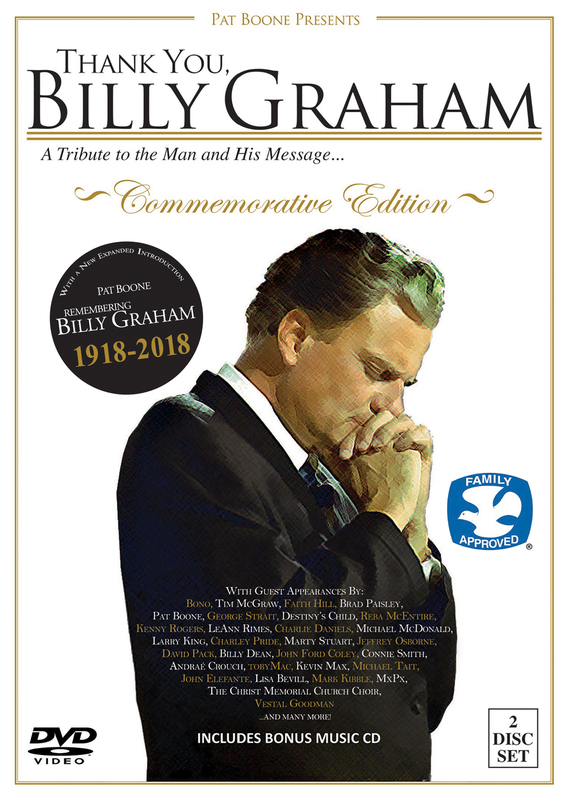 Now, in this special Commemorative Edition, one-of-a-kind biographical tribute, with a new and expanded introduction by Pat Boone - "Remembering Billy Graham," the world's leading entertainers come together to pay homage to this American hero through personal testimonials and the joining of their voices in a multi-artist, anthemic performance of "Thank You, Billy Graham," written and produced by motion picture actor and recording artist Pat Boone, Grammy-winning Rock artist David Pack (Ambrosia), and Country star Billy Dean. Special features include hundreds of hours of interviews and in-studio footage condensed into a documentary style, behind-the-scenes look at "The Making Of" this heartfelt tribute to the life and ministry of Reverend Billy Graham. Not since "We Are The World" has there been a multi-artist project of this magnitude! Not since 'We Are The World' has there been a multi-artist project of this magnitude!